In the early 1990’s Boeing needed to find a replacement for the aging Boeing 767 which was experiencing a down turn in sales. Two alternatives were investigated. The first was a sub-sonic cruiser which would be capable of cruising at Mach 0.98 for around the same fuel economy as that of the Boeing 767. This would be very attractive in being able to dramatically reduce journey times whilst staying below the speed of sound. This is important as the sonic boom generated by Concorde limited that aircraft to only being able to be operated over water and therefore making it unsaleable to most airlines. The sub-sonic cruiser did attract considerable interest from the market. The second option was an up-sized version of the Boeing 747, the Boeing 747X. This was intended to be a competitor against the Airbus A380, however reception by the market for this solution was luke warm. The September 11, 2001 attacks turned the airline industry on it’s head. All of a sudden fuel costs started to escalate and airlines’ focus moved from speed to efficiency. The sonic cruiser was no longer a viable option. 2002 – Boeing drops its “Sonic Cruiser” concept, responding to airlines’ calls for better fuel efficiency rather than extra speed. June 2003 – The company dubs its new, carbon-composite airplane the “Dreamliner” after an online competition with 500,000 entrants. Dec 2003 – Boeing approves an initial version of the plane, with the temporary name 7E7. April 2004 – Japan’s All Nippon Airways (ANA) becomes the launch customer with 50 orders. Being a launch customer often earns discounts up to 50%. Dec 2004 – The company ends 2004 with 56 orders for the new plane, fewer than it had expected. Jan 2005 – Boeing gives the plane the official designation Boeing 787 Dreamliner. Dec 2005 – It ends 2005 with 232 orders for Boeing 787s, for a running total of 288. 13 July 2006 – Popularity of the Boeing 787 Dreamliner design forces EADS unit Airbus to go back to the drawing board on its competing Airbus A350, relaunching it as the Airbus A350 XWB (eXtra Wide Body). Dec 2006 – Boeing ends 2006 with 160 orders for Boeing 787s, for a running total of 448. Jan 2007 – Unconfirmed talk that some Boeing 787 suppliers are falling behind schedule sends Boeing shares lower. Boeing CEO Jim McNerney says the plane is on target for its first test flight around end of August 2007 and first delivery May 2008. 13 May 2007 – Boeing starts to put together the first Boeing 787 Dreamliner in Everett, Washington. June 2007 – Reports surface at the Paris Air Show that the Boeing 787 is up to four months late. Boeing says the first test flight may slip to September 2007, while still on schedule for a first delivery in May 2008. July 8, 2007 – The gleaming shell of the first 787 is rolled out in front of 15,000 ecstatic employees and customers at Everett. July 25, 2007 – Boeing shares hit an all-time high of $107.80, boosted by strong Boeing 787 orders. The company admits the plane is running slightly behind in certain areas but holds to schedule. Sept 2007 – Boeing puts back its first test flight by about three months because of a shortage of bolts and problems with flight control software. It also shifts its flight target of mid-November to mid-December 2007 and keeps May 2008 delivery target. Oct 2007 – The company announces a longer delay, due to production problems, pushing the first test flight to end-March 2008 and putting back first delivery by about six months to late November or December 2008. Oct 2007 – Boeing 787 program head Mike Bair is replaced by Pat Shanahan from Boeing’s defence unit. Dec 2007 – Boeing says the 787 is sticking to its revised schedule and ends the year with 369 orders for the plane in 2007, for a running total of 817. Jan 2008 – After two weeks of rumours, Boeing announces a further three-month delay due to problems with unnamed suppliers and slow assembly progress at the Everett plant. It also pushes back test flight to end-June 2008 and first delivery to early 2009, making the plane about nine months behind its original schedule. March 2008 – Boeing shares hit a two-year low of $71.59. The company admits it had to redesign centre wing box to make it stronger. 28 March 2008 Boeing announced that it plans to buy Vought Aircraft Industries’ interest in Global Aeronautica, owner of the South Carolina plant that manufacturers major portions of the Boeing 787s fuselage. The purchase will make the assembly plant a 50-50 joint venture between Boeing and Italy’s Alenia Aeronautica. April 2008 – Announces a third major delay due to continuing problems with unfinished work from suppliers. It sets the first test flight for the fourth quarter of 2008 and the first delivery for the third quarter of 2009, about 15 months behind the original schedule. September 2008 – A major strike at Boeing lasts 57 days, and it then takes another month to get production back up to speed. November 2008 – A major mistake is found where fasteners in the first 5 prototypes are incorrectly installed. These need to be removed and reinstalled. A major embarrassment. December 2009 – Boeing advises another six month delay. Management reshuffles take place. First flight is now due for April/June 2009, and ANA is advised that delivery of their first plane will be in first quarter or 2010. 2008 ends with over 900 orders. January/February 2009 – Industry downturn cause LCAL (leasing Co.) and Russian S7 group to cancel orders. Other companies also push back their delivery dates. 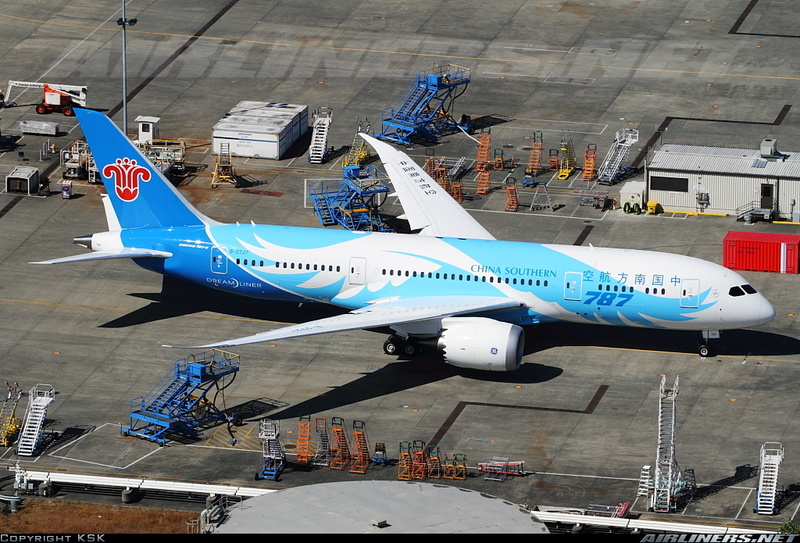 May 2009 – The first Dreamliner pushed onto the flight line, due for first flight in June. A fault in the wing box join is found but not made public. June 2009 – At the Paris airshow it is announced that the Dreamliner will fly by the end of the month. It is then determined that the wing box structure must be fixed before a flight can take place. To the dismay of the industry Boeing postpones the test flight indefinitely. QANTAS cancels its order for 15 Boeing 787s. July 2009 – Engineers begin work on the flawed wing box joint. August 2009 – A new schedule sets the first test flight by year end and delivery by the end of 2010. October 2009 – Cancellation of a ten plane order by a UK based charter company reduces the orders to 840. November 2009 – Engineers complete the wing box joint redesign and stress testing show the plane ready to fly. 15 December 2009 – After a comprehensive ground tests, the first flight test takes place. First half 2010 – Six test aircraft, four with Rolls Royce 1000 engines and two with GE GEnx-1B64 engines endure a rigorous flight test program. July 2010 – The Boeing 787 Dreamliner attended its first Airshow at Farnborough. November 2010 – It was announced deliveries could be delayed a further three months to give time to make modifications around issues found in testing. 9 November 2010 – An emergency landing was required in Texas when an on board fire was found. Test crew evacuated safely after landing at Laredo. January 2011 – Boeing announced that the first delivery would not be until the third quarter for 2010 due to work required after the on board fire. July 2011 – ANA (All Nippon Airways) conducted a week of testing with a Boeing 787 on Japanese air routes. 13 August 2011 – Boeing completed certification testing for the Boeing 787 8 with Rolls Royce Engines. 26 August 2011 – Boeing attained certification from the European Aviation safety Agency. 28 September 2011 – ANAs’ first Boeing 787 Dreamliner touches down at Tokyo Haneda Airport. 30 May 2013 – Singapore Airlines was announced as the launch customer for the Boeing 787-10. 17 September 2013 – Maiden test flight of the Boeing 787 9 from Paine Field to Moses Lake. Deemed very successful. 08 July 2014 – Air New Zealand takes delivery for their first Boeing 787 9. 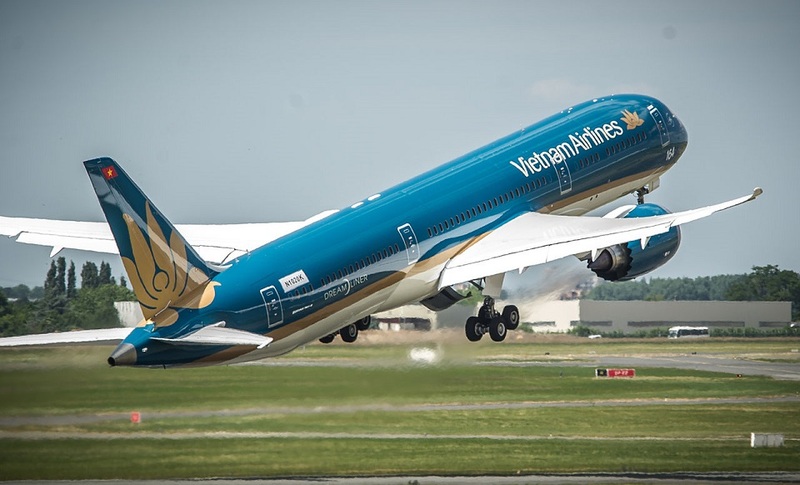 Painted in the distinctive black livery, it was handed over in a ceremony at Paine Field. March 2016 – Assembly began on the first Boeing 787-10. 17 February 2017 – The first Boeing 787-10 rolled out of the factory. 31 March 17 – Maiden flight of the Boeing 787-10 lasting 4 hours and 48 minutes. May 2018 – Launch customer Singapore Airlines is expected to receive their first aircraft. 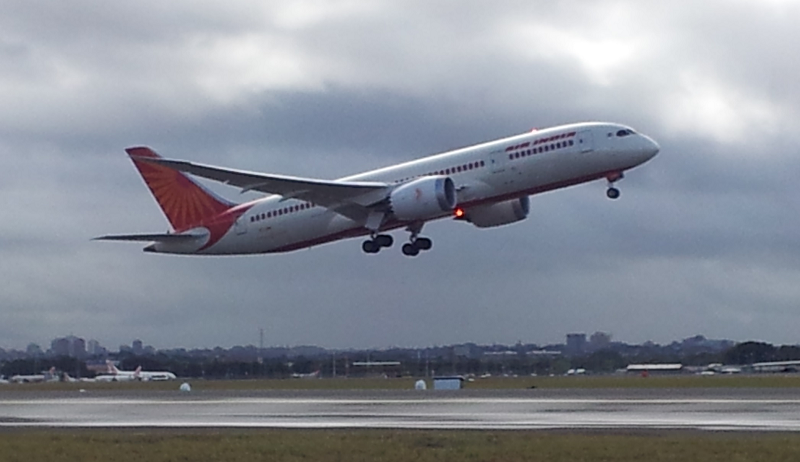 Air India Boeing 787 8 climbs out on a Sydney gray day. How powerful is this wonderful aircraft! I had the blessed opportunity to fly United 195 August 2nd- from MUC to SFO in business class- seat 3L -and a dream came true! The attention on-board was delightful, the food and drinks first class! Thinking of the past 1955,1960,1970,1980,1990 and being able to travel in one classes of service, I still prefer the seating map of first and business at that time! I have no admiration at all for ( these new “boxes”) available now in business class! There is a lot of waisted space for no reason at all! and much less chance to communicate with your neighbour travel fellow! and… the cost for travelling in Business Class is outrageous! thank you for stopping by. That must have been a great experience. I agree that the boxes are a bit off-putting and you do lose that feeling of being part of a group of travellers. I must admit that I experienced it once on a British Airways Boeing 747 flight from London to Johannesburg, it was actually the best sleep I ever had on a plane. Must have been the feeling of being more private.